If traps aren't currently a part of your strategy, please take some time out to consider whether or not they should be! This is of course a great thing to look at! I was only fading trading range breakouts scaling in my position as market moves out until a specific SL, this way I am able to get the best results with the minimum risk. I stopped fading counter-trend moves so I could focus only on trend-side setups, but I never thought in getting into the move after the market breaks the trap bars. I will definitely pay special attention to this! Yes, look at this chart. Lower left to upper right. It’s a strong uptrend. Larger green bullish candles vs smaller red bearish candles. No pullbacks showing any bearish strength at all. There is absolutely NO reason to be fading this market (accepting that we’re lacking higher timeframe context by examining just the one single chart). The higher probability option in the event of a stronger trending move, is to ALWAYS trade in the direction of market bias. If you feel you see shorting opportunity easily, by all means watch for it. But don’t trade it. Watch for it to fail and then consider whether or not that offers entry opportunity with-trend. 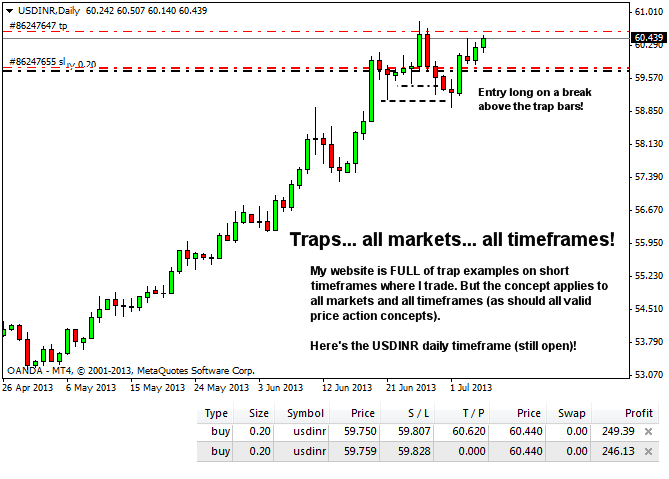 Quite often failed counter-trend moves can provide a great with-trend entry.